My trip of a lifetime. Anybody’s lifetime! 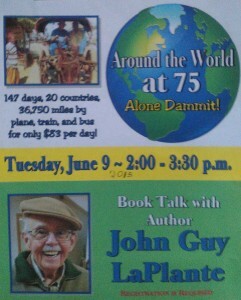 I’m talking about the incredible and so challenging dream come true that I wrote up in my book, “Around the World at 75. Alone, Dammit!” Yes, alone. And what a shocking development that turned out to be. Because two of us started out! My friend Keith and I. He dropped out. When we were just a few days on the road! How could I go on all alone? It seemed impossible. Well, ust a few days ago, I gave another talk about that grand adventure. People love hearing about it. I spoke to 48 people at the Wolcott Library in historic and charming Litchfield, Conn. At the right is the poster the library created. The room was full. They were fascinated. Easy for me to see that by the questions they asked and how they lingered. So my driving way up there was worth it. What a nice coincidence! This was exactly 10 years since I completed that terrific adventure and published my book. Giving that talk brought back such a torrent of memories about that huge challenge that I decided to write this about it for you. Easy. All I had to do was let you read the final chapter in that book of mine. It was Chapter 33, entitled “Amen!” Notice that exclamation mark. So well deserved! I had so, so much to be grateful for. I should have added all the planning, all the expense, all the hard work day after day, all the risks that were inevitable, all the joys and headaches of it. And the huge disappointment just a few days after the start. I thought the trip was over. How to best tell you all that? Well, here’s the final chapter in my book about that epic adventure. It begins right after the four squiggles. In my many stops around the world, I always thought of home, of course, and found myself making endless comparisons between home and wherever I was. I liked some things; I didn’t like others. I preferred some ways here; some back home were definitely better. A normal process. But finally home under the Stars and Stripes, right outside the plane I was tempted to get on my knees and kiss our good, old American terra firma. I did not do that–the concrete was so oily. But yes, for a moment I thought I should. I had found out that the U.S. is like every other country I had seen – imperfect. But ours is less imperfect. In many cases, far less so.No wonder people everywhere dream of coming here. Finally I opened my suitcase for the last time. I had been on the road 147 days. Had visited 29 major cities in 18 countries – in Asia, Southeast Asia, India, the Middle East, Africa, South America, and Central America. I had skipped Europe and other parts because I had been there a lot. I flew close to 40,00 miles by the time I got back home to Connecticut, on 21 airlines, with another 3,000 miles by bus and train. And yes, of all those airlines, as I’ve already mentioned, only two were American – in fact, they were American Airlines and Southwest. Others were well known, such as Japan Airlines, Indian Airlines, British Airways, Varig, and Malaysia Airlines. But others were unknown to me: Dragonair, Garuda, Silkair, Bangkok Airlines, Jet Airways, Gulf Air, Egyptair, Kenya Airways, Pluna, Tam Mercosur, Lan Chile, Aero Continente, and Copa Airlines. At each stop, I wondered: what is the next airline going to be like? They all turned out to be satisfactory, and on none was the service bad. Some had wild color jobs – I wish I had a picture of every plane! Regardless of the airline name painted on the side, most of the planes were American made – Boeings and one McDonald-Douglas. I rode Airbuses several times. Very nice. And two Fokkers. And one ATR Turboprop. They all got me there, effortlessly. I never felt unsafe – in fact, I thought I would like to learn to fly some day. It seemed the big foreign airlines always had their own native captain and first officer in the cockpit – or flight deck, as they say nowadays. But the smaller airlines seemed to favor American pilots. It would be interesting to interview some of these pilots and find out why they fly for these foreign outfits – probably money, interest in that country, adventure, a problem back home. But flight attendants were always local. Most impressive for quality certainly was my first airline, Japan Airlines. Outstanding. Others were excellent – Malaysia, Indian Airlines, and British Airways. Announcements on all planes were always made in the local language, then in English – English is the official airline language around the world. In some cases, the English announcements were difficult to understand because so strangely accented. How do people who can’t understand English make out? It has to be a major accomplishment for someone to fly around the world who has grown up in Morocco or Romania. People are people. The airline uniform they happened to be wearing was insignificant. I think the nicest attendants I met were two black ladies on Kenya Airways. Thoughtful service plus lots of fun. In fact, I still get occasional e-mails from one. I had written more than 65,000 words and taken 1,500 photographs. This was an ongoing, every-day effort. I kept a detailed journal which I wrote out every evening before bedtime – on some evenings it was hard. I was so tired. I had to force myself. I wrote 32 articles, each with thousands of words, and all churned out in spurts – whenever I could get to a computer, although I scribbled sections here and there on a big pad as free time came up. The work was difficult beyond description, not because of the writing, but the computer difficulties. I worked on all kinds of computers, renting them by the hour in computer shops here, there, and everywhere,, and many were borderline junk. In some places, the machines were crammed together – just no place to put down a notebook or open a reference book. My elbows would nearly smash with those of the people to my left and right. Sometimes it took a lot of searching to find a decent shop. I am sure I used more than 200 computers along the way. On some days I worked at two or three. If this aspect of my trip interests you, take a look at the Backback section of the book I wrote about it. That was the section where I crammed in all kinds of travel tips I picked up and impressions that I felt I should share. And several times, despite my best efforts and determined back-ups, I lost complete articles through technical glitches. In all modesty, I consider my 32 articles a major accomplishment from the physical point of view – the blood, sweat, and tears that work took out of me. There is something to be said for old age and maturity. I am positive that if some of these difficulties had assailed me when I was 25, say, I would have quit. Yes, would have given up. I am sure some of you are thinking, “John, why didn’t you take a laptop with you?” I considered doing that. It would have been a big, big mistake. Many reasons. Again, go look at my Backpack. I was far from the end of the trip, but already I had much material. I planned to hand-write the first draft on this flight. And I did. I wrote and wrote hour after hour. Yes, in good old handwriting. I got off in Buenos Aires elated. That’s the right word. Now back home, that’s what became my Backpack. Yes, I had a fabulous trip. I saw some of the greatest wonders of our world, man-made and natural. I saw the Great Wall of China, the Grand Palace in Bangkok, the Temple of Venus in Lebanon, the Great Pyramids of Egypt, the magnificent temples of India, ancient and long-forgotten Machu Picchu in Peru, and the Panama Canal! Those are just a few. I saw the deserts of North Africa, the incredible landscapes of Africa all the way south to Cape Town, the pampas of Argentina, the Andes Mountains, Iguassu Falls, the lakes of south-central Chile and nearby Argentina, the jungles of Central America. Again, that’s a short list. I saw the great cities. Tokyo. Beijing. Hong Kong. Singapore. Bangkok. Calcutta, Delhi, and Bombay and Madras in India (remember, those two have new names now, Mumbai and Cernai. I got to see Beirut, Cairo, Nairobi, Cape Town. Sao Paulo, Rio di Janeiro, and Santiago in South America. Plus others. Wow! I had a thousand wonderful experiences and just two close calls. A car drove over my right foot in India, and I came close to breaking a leg on a stairway in Bangkok. Yes, I was very lucky. I lost a wallet in Panama City, and I foiled a pickpocket in Montevideo. At one hostel, somebody stole my essential anti-malaria pills, but I managed to replenish them. Taking that pill was my most unpleasant moment each day. Thirty minutes later, I felt so nauseous. I was not ill once otherwise. No diarrhea. No food poisoning. Not once did I consider aborting the trip, except for that moment when Keith told me he was quitting. Everything considered, I was very lucky. I was lucky to have good friends here and there, and I have mentioned them at the front of the book. What a joy and solace they were. I spent about $12,500 for everything. And I mean everything. Visas, medical shots, all travel of whatever kind, and food and admissions and amusements, plus lodging. My purpose was to see those places and countries and their people as they really are. So I kept clear of most places that attract Americans. So, no fancy hotels or restaurants. Besides, that would have made the trip unaffordable, of course. I used hostels as first choice, and if not available, then small local hotels. I never felt a bedbug, by the way. And I had such a good time in doing it that way. I think that $12,500 was cheap. I could have spent more money, well, up to a point, and made the trip a lot easier. But I didn’t want it to be too easy, and I wanted it to be rich in everyday human encounters and experiences, and so it was. It broke down to about $83 a day. I’m not bad at rationalizing. When I came up with that total, I thought for a minute and concluded that many people spend that much in the depreciation of a new car in just a year or two. Isn’t that so? I considered it money well spent. Furthermore, as you know by now, I looked at it as an investment rather than an expense. Good investments pay off. This was a very good one. My whole purpose was to see the world as it is. I wanted to travel as an ordinary person, relying more on serendipity and a friendly and adventurous spirit than a fat wallet. I admit I was very scared a couple of times. All in alI, I had a grand time. That’s the plain, honest truth. I wouldn’t change much if I did it again. What did I miss? I promised I would tell you. Having more changes of clothing. Having more time to relax. It was always go, go, go. Having a good reading light next to my bed – excuse me, it was a bunk and not a bed most of the time. Small things. But the computer work was exhausting and discouraging. I am repeating myself, I know. It shows how tough it was. I am glad I did it, however. I encourage you to travel around the world. Travel is getting easier and cheaper, yet a trip around the world for fun is still a grand adventure. And we say the world is getting smaller. Well, we think that. But it is still a mighty big place. You don’t realize how big until you start out. Definitely not that difficult t do it my way. There’s a simple test that I recommend for you. Board a bus to your nearest big city with an airport, then make your way to that airport by public transit—by bus or trolley or subway. Not by taxi. Doing it by public transit like that is important. Then find a place to sleep. Then buy a ticket and fly to another big city in the U.S. Then get downtown again by public transit, then find a place to sleep. Do that returning home, too. To experience foreign travel, do the same by going to Montreal in Quebec, say, or Guadalajara in Mexico. They’re nearby. So interesting. Won’t take too long. Will cost you far less than crossing an ocean. Again the same way. That will give you the additional experience of entering another country and dealing with a different culture and language, different food, different money. If you can handle a trip like that, wonderful! Then you can make it around the world. Going around the world just entails completing that cycle a number of times. Of course, be realistic. Don’t be surprised when some little things go wrong. Maybe something big will go wrong. That’s life. Something big can go wrong at home as well, of course. If you have the spirit to undertake such an adventure, you have the spirit to confront whatever comes up. Beware of the worst terrorist of all. It’s the mosquito! And remember that all hotel rooms look the same after the light goes out. That’s a joke, but it’s an illuminating joke. Each of us has one or the other of the following two basic viewpoints as we go about our life: the bottle is half full, or half empty. I know how I look at the bottle, and I hope you look at it the same way. And when we set out to travel, we find we react in one of two ways as we encounter strangers. We can view a stranger – any stranger, regardless of his passport, complexion, clothes, or language, whether he eats with a fork or his fingers, or uses toilet paper or finds some other way, or travels by public transit or hitchikes – either as a potential enemy or a potential friend. I’ll let you decide which way you lean on those choices. I hope it’s the first way. The worst disease of all for a grand adventure like this is a mental one. It’s xenophobia– the unreasonable fear of strangers. Let me again just pass on advice that my father gave me when I was a boy. He told me, “Jean-Guy (that’s my French name) if you smile, everybody will smile right back.” It’s true. It works. It makes a big difference. I certainly want my grandchildren to make a trip like mine. I believe in higher education to the ultimate, but I believe that such a trip would be the best part of their education. I hope that they won’t wait as long as I did. Again, such a trip shouldn’t be viewed as an expense. It should be viewed as an investment. I made many friends. (Some that I am still in touch with.) And I hope no enemies, of any race, color, creed, or political belief. “Travel is fatal to prejudice.” That’s one of Mark Twain’s terrific insights. I have found it true. International travel is important for numerous reasons. This is one of the prime ones. We lose some of our prejudices. I hope you will circle the globe, in one loop or in stages – after all, that’s the way some people hike the Appalachian Mountain Trail from Georgia to northern Maine. The whole thing or by sections over a period of time, even years. Bon voyage to you. Don’t let your dreams slip out of your fingers. We make a lot of our own luck in life, good and bad. Sometimes when we set out, we leave bad luck behind and find good luck ahead. Hopefully not vice versa. Brings back memories for me too. Though you did all the work, we went through most of your book together and you added much interesting commentary during the process. Between hearing your talk twice and going over the book with you, I made a vicarious journey around the world. We leave for London Monday. If you’re still in Connecticut the end of July, let me know. Perhaps we can do lunch.